Well ladies, I can't believe that you two did all that and both of you are correct. I will have to call it a tie so I will send both of you something. Please email me your address and then I will announce what you have won. Good game to both of you. Girls, All the answers to these questions are somewhere in my blog. You will have to search to find the answers. Good Luck. Be sure to email me your answers. You have until midnight tonight. 1. What two stamp sets did I feature in the last two Royal Blog Tours? 2. 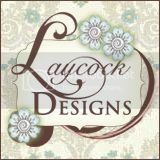 What is my favorite technique I use for Cardmaking? 3. What is on the front of my ScrapBox that I got from my daughter that is not from SU? I am giving you a day off since there are only two left in the running. I will have to come up with some good questions to determine the winner or we may go on for awhile, or I may just draw a winner. We will see. Kathy and Judy are the only ones left. Good luck tomorrow. Congrats to all who have continued. Remember to email (08secretsis@gmail.com) me your answers. Only people who have completed and gotten the answers correct for game day 1 and 2 are allowed to continue. 1. What is the name of the mini catalog that runs through January 3rd? 2. What two specials are in effect until Nov. 30th? 3. How many of the stamps on pg. 24 "Tags til Christmas" in the mini have punches that go with them? Only four of the original 7 haved moved on to the 3rd day. You can only answer if you answered the questions in the correct time and got all the answers right. If so, you may continue to the next level. As soon as there is only one person left, that person is the winner. 1. How many punches coordinate with the hostess set "Punch Potpourri" on pg. 10? 3. 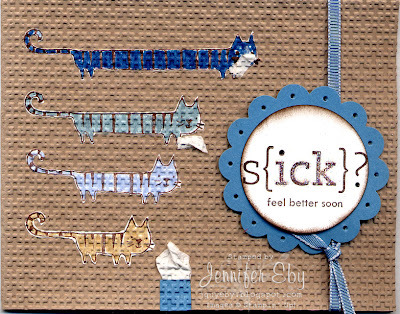 One of our Make and Takes uses the Level 3 Hostess stamp set on pg. 15. This versatile stamp set is called what? Please see directions in the post below. 1. What is the name of the punch that a lot of designers are using in different ways than it was meant and used to create different characters from what was intended? 2. Name the 5 New In-Colors. 3. 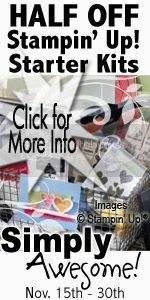 New favorite stamp pictured in samples on the front cover, page 123 & page 127 is called what? Every Day for a while, I will post some questions and if you answer them correctly, you can move to the next level. Each answer is to be put in the comments in order of the questions asked. I will post the correct answers at midnight, EST. If you got them right then you may play on. If you didn't your quest for candy ends here. Good Luck. The 1st day game will begin Friday at 6am EST and end at midnight. 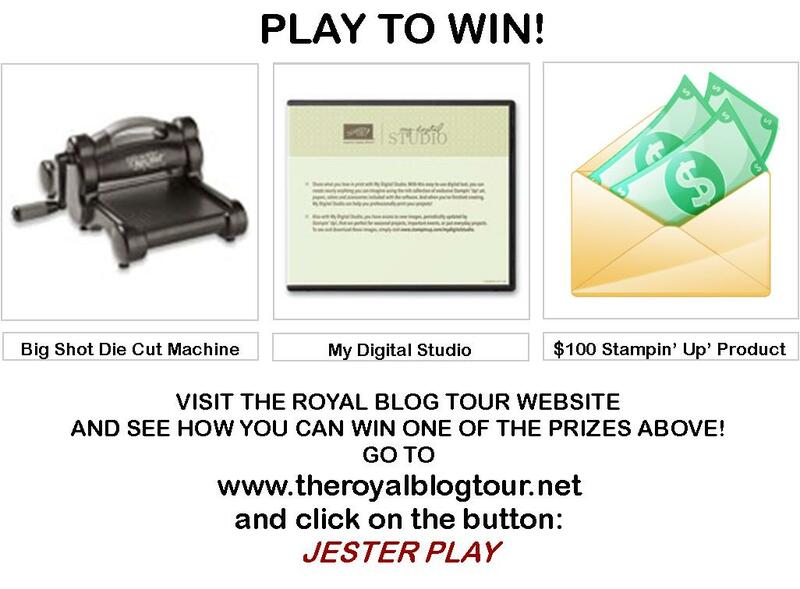 Too all winners of my blog candy from the Royal Blog Tour, your items will be mailed on Monday. I hope everyone has a wonderful and fulfilling Thanksgiving. Watch for new game coming beginning Black Friday. Annual Stampin' Up! Online Extravaganza Sale! LOTS of discounted Bundles and other fun stuff at 20-50% off! 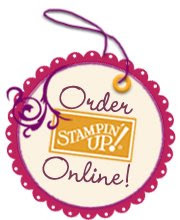 EVERYONE that goes to my online store and creates their online shopping 'profile' (with their name and mailing address) will be on my list for the NEW mini catalog and Sale-a-Bration brochure coming out soon and directly to YOU from Stampin' Up!! I will finalize my automatic mailing list late on Nov 30th. Additional products from current catalogs may be purchased on the same order to get the total up to qualify for the free shipping offer below. Free shipping is available for qualifying online or demonstrator orders only. Other order types (such as workshop orders I place for you) will not qualify for this promotional offer. 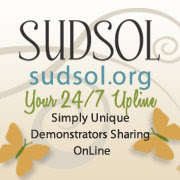 Become a Demo and save Big NOW ---- Half OFF! Ask me about it. Would love to be your upline. I have to wait until payday to send out your Blog Candy. I usually send everything right away, but I am just not working now and having to pinch pennies. Hope you understand, but they will be there ASAP. I will let you know when they are sent. 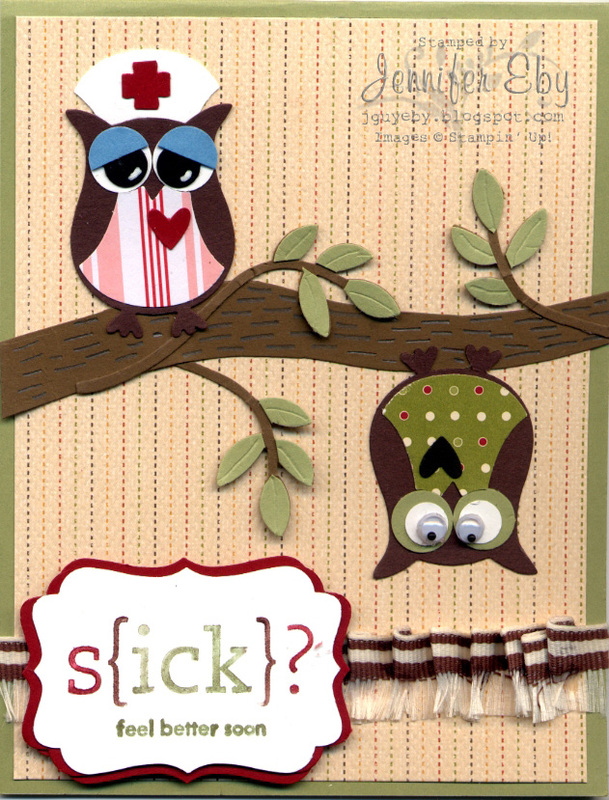 Congrats to Suzanne; She said "My favorite card is: Sometimes Waiting is Worthwhile. I love the visual effect of the caterpillars turning into butterflies. It's a great play on words and visual imagery." 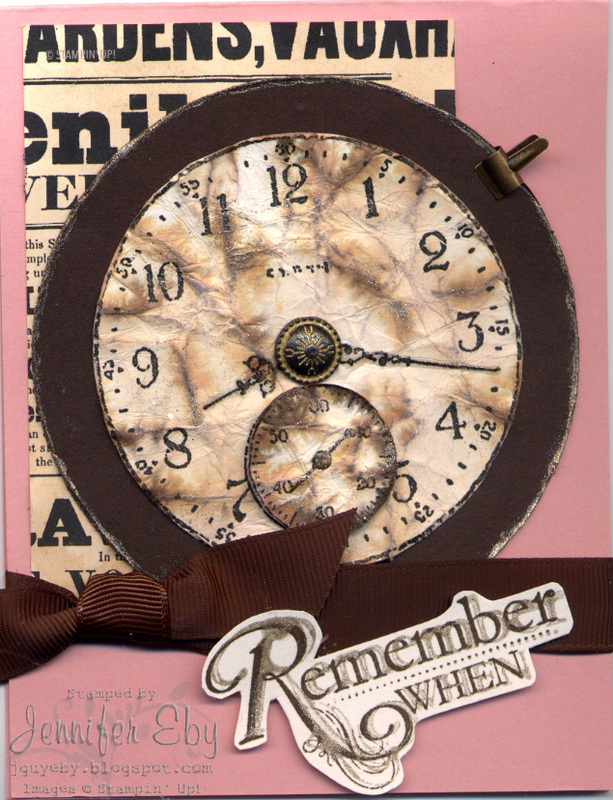 "Just to let you know how much I enjoyed the "Time Gone By" card. that was my favorite. 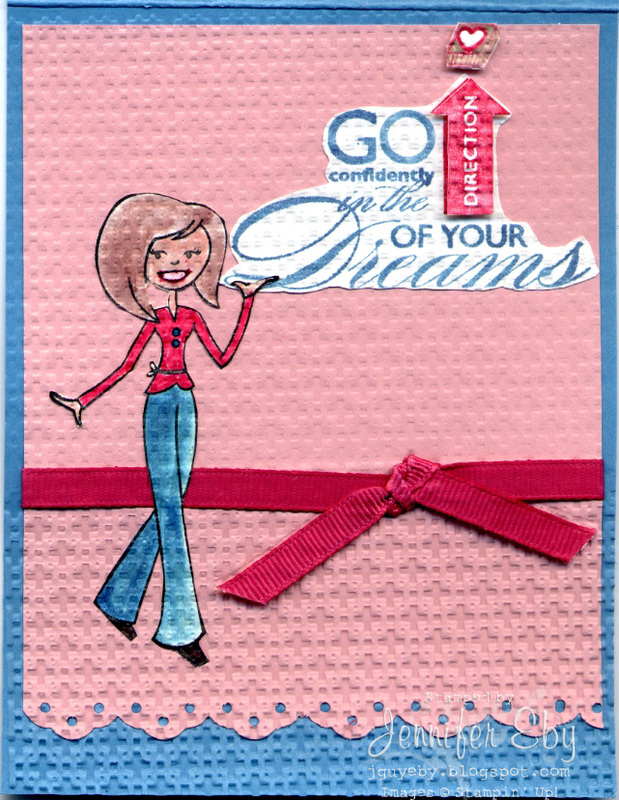 I love this stamp set and have not used it yet because I haven't seen any examples that was truly inspiring and this one did it for me. I might case this card if you don't mind." 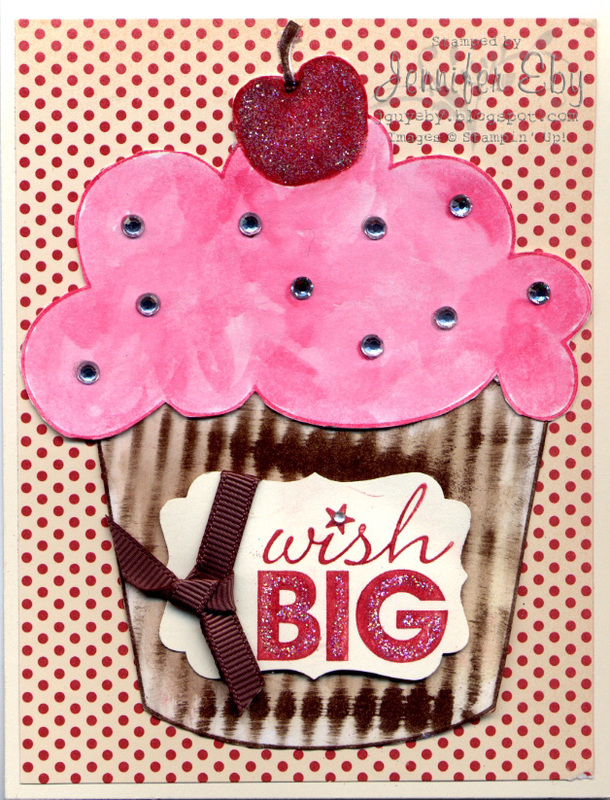 Congrats to Roberta for winning the cupcake card. She said: "Love all your cards. My favorite is the cupcake card. I like the card because it would be a fun way to give them a zero calorie cupcake on their birthday. Thanks for sharing." The winner of the Clown Card is Debbie Flattum. She said "You are very talented, Jennifer. Trying to pick a favorite ONE is tough. It's between 'Get Thee Well' and 'Clowns Make Thee Laugh'. 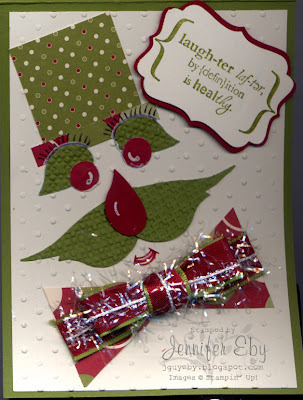 I am going with the Clown card, because I enjoy punch art and love the way you used the bird punch to create this card. Thank you for sharing your talents with us and offering blog candy." Martha Haddock was chosen from my random number generator. This is what she says: "Oh my Goodness! I am so excited! I NEVER win anything so this is totally awesome! Thank you thank you thank you!" Now for the other surprise for the others that entered by email. There were 3 who liked the Wish Big Cup Cake, 26 who liked the Clown laughter, 6 who like Time gone by and 4 Waiting is worthwile. No one like Go in the directions of your dreams.....lol...... but I really didn't like it that much either. Most liked the above card. I will chose one person by the random number generator for each card and that person will win that card. I will contact you personally before it is made public on my blog. There were about 5 who left emails but didn't tell me which card they liked and why. 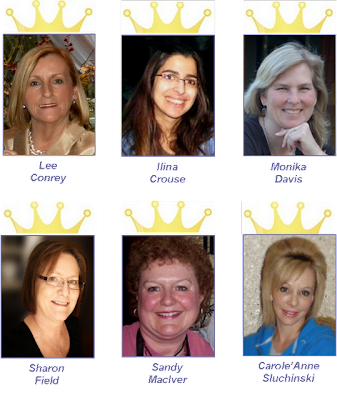 The Royal Blog Tour is over and I hope you enjoyed your visit. 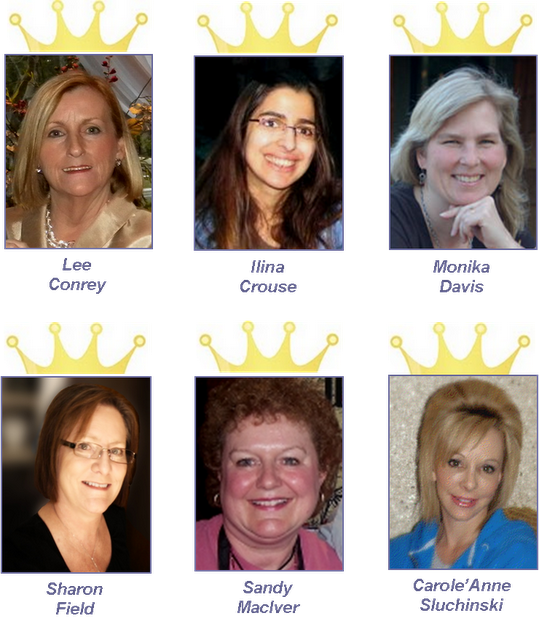 The links will stay up for awhile so you can go to: http://www.theroyalblogtour.net/ and still see everyone's work if you need more time. I appreciate all who responded with comments. I had over 70 people email me and later today I will use the random generator to pick a number for the winner. I will contact the winner and after that, I will announce who it was and what they won. The people who left comments on my blog will be added to the other comments left and when December 1st rolls around, they will be entered in my monthly blog. Good luck everyone. Above is a new card I did using the inlaid technique. 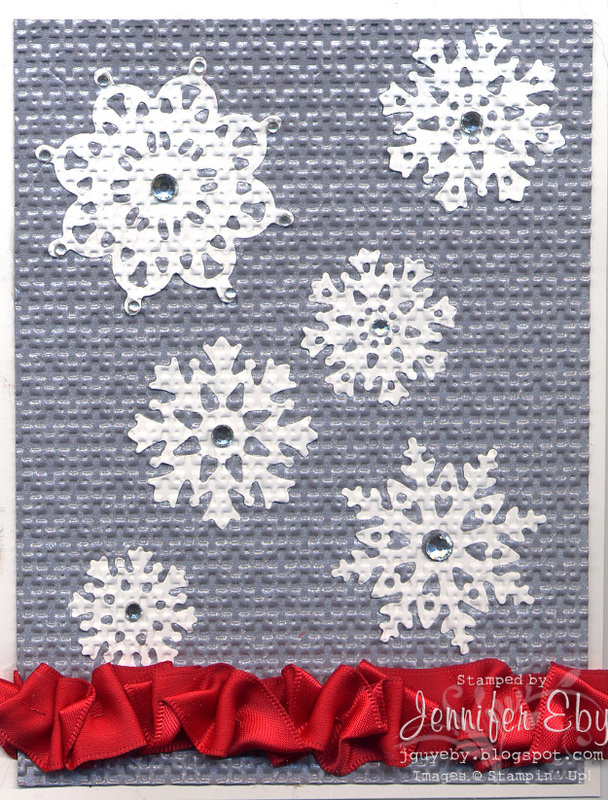 I glued the snowflakes onto silver cardstock and then ran through the big shot using the lattice embossing folder. I then put a scrunched up real red ribbon on the bottom. I did not want to put any saying on the front. I also put rhinestones on the snowflakes. It is on page 147 of the regular catalog. If you want to know how and what supplies I used, please email me and I will provide you with the directions. I am also offering Blog Candy. What I am giving away and what you must to do to be in the drawing is at the end of my samples. I have crafted six cards for thee to look at on thy tour. I got the idea of the nurse from Kay Sha. I made her into a Candy Striper. She has some really cool owl creations. Otherwise, the rest of the card was my creation. I just love the idea of the Caterpillars that turn into beautiful butterflies. Now that is so worth the wait. Notice that their antenna are the same through the conversion. Some people think clowns are scary but they are supposed to be funny and make you laugh. Mostly used the bird punch on this one. This card needs little explanation. I used the distressing kit on this one. Need I say more? 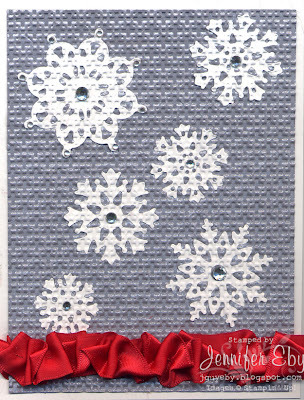 This is a technique I learned at regionals where your put the finished card in the embossing folder. Gives it a whole new look. 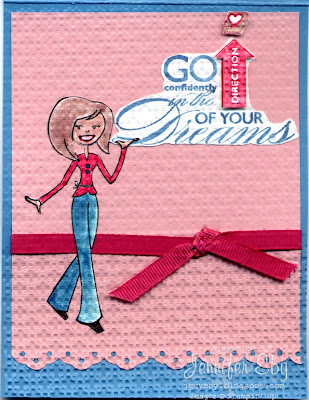 Go in the directions of your dreams and become a SU Demo. I took the stamp and colored it in with markers so I would not ink the inside of the stamp. I cut it apart and crimped the bottom (paper part) of the cupcake. I watercolored the top and added crystals where the tiny circles were and glittered the cherry. A big cupcake should make you wish big. 3. Tell me why you like the card. I will pick a random number from the first to last number of emails received. It will end when the blog tour ends. I will inform you if you win. You will win a current SU stamp set and some extra SU products. 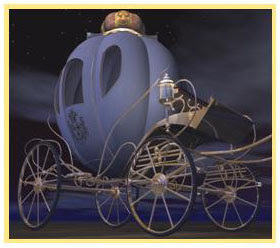 You may comment below but that will only enter you in my monthly blog candy and not the Royal Blog candy. You may do both for a chance to win twice, but I do need your email if you comment below. I offer very good monthly blog candy, usually a stamp set. You will next visit the Royal Princess Linda Aarhus. You will love her creations. There are a wide variety of *demonstratable* projects ready for your to view from 22 of our members! and check them all out along the way! Congratulations to Kathy McCloskey who won October's Blog Candy. I must repeat that someone else actually won but did not leave their email address so I must impress on you that if you want candy, you must leave an email with your comment. But Kathy was next on list and congrats to her. She will win the wooden "Happy Grad" and "Christmas Greetings" sets plus a few of my handmade cards. Keep the comments coming. On the 4th of November beginning at 9 pm EST, the blog tour begins, this is a must for anyone wanting ideas. I think it is the best tour around. Be sure to check it out. I have chosen one stamp set for you to experience. 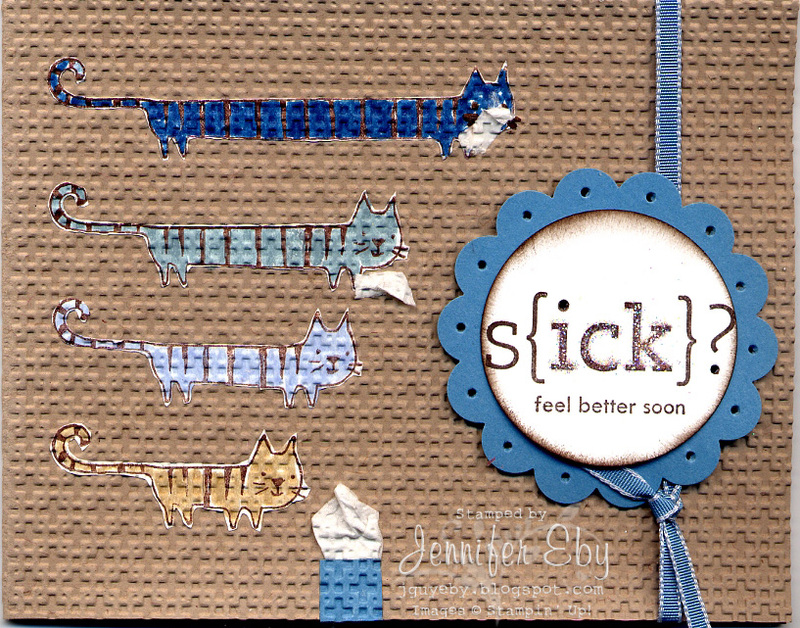 Here is a card I made with the new technique called "inlaid" because all the additions to the card look inlaid once you put them through the embossing folder. I have notified by email, October's winner for the blog candy. As soon as I hear from her, I will announce who it is.